It's one of life's simple truths: automotive journalists get to have all the fun. You know it. Your friends know it. Your wife knows it. 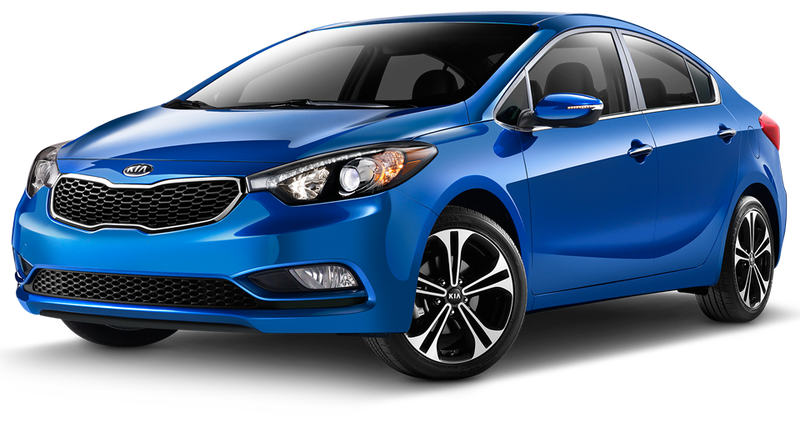 And now, I especially know it, because I recently got the chance to spend a few days driving the all-new Kia Forte. It was an excellent experience, and I strongly recommend that you give it a try, assuming your local Enterprise hasn't run out of them. For those of you who aren't familiar with the Forte, allow me to paint you a detailed picture, drawing from my weeks of experience writing about automobiles. It's an economy car. It looks like an economy car, it handles like an economy car, it accelerates like an economy car, it sounds like an economy car, it feels like an economy car, and it has that same zest for life you really only get with an economy car; the one that reminds you, day in and day out, that every single part was created by the lowest bidder. But here's the thing: it has more features than a Panamera. This is the part where I usually say "Ha ha," and tell you all about the funny little joke I just made, and you silently think to yourself: Is it too late to renew my subscription to Road & Track? But this time, I'm not exaggerating. The Forte I drove — some high-end trim level which I'm now calling the "SuperForte" — came with keyless access, push-button start, a heated steering wheel, xenon headlights, a ventilated driver's seat, heated rear seats, dual-zone automatic climate control, and a navigation system. Yes, folks, that's right: heated rear seats… on a Kia! Not only that, a Kia that competes with the Honda Civic. A Kia that's slotted below the Optima in the brand's lineup! It used to be that the only way you could get cheaper than the Optima was you had to tip over your laundry hamper and ask your buddies to videotape as you rode it down the stairs. Now the damn thing has heated rear seats! This phenomenon isn't reserved for the Kia Forte. A few months ago, I went to the Mazda3 launch, where I spent the afternoon driving around San Diego in a Mazda3… with adaptive cruise control. That's right: this tiny little compact sedan — proud member of a segment that, only a few short years ago, included the Chevrolet Cavalier — now employs the same technology to avoid hitting stuff as a nuclear submarine. All of this brings me to my point, which is the following: Mercedes-Benz feels more pressure from brands like Mazda and Kia than anyone else in the car industry. Before you accuse me of saying that the Mazda3 competes with some Mercedes-Benz, let me quickly explain that's not where I plan to take this. We all know the Mazda3 could never compete with Mercedes-Benz, because the little Mazda will rust to bits in 10 years. Whereas a high-end luxury vehicle such as, for example, the Mercedes S-Class — one of today's finest automobiles; built with high-end German precision; engineered to automotive perfection — will suffer massive electrical failure long before it ever reaches that point. No, the reason Mercedes-Benz feels pressure from mainstream brands is simple: they're rapidly making technology seem a lot more accessible. Adaptive cruise control is a great way to help me prove my point. A few years back, Mercedes rolled out adaptive cruise control on the S-Class. And S-Class buyers responded in the only way they knew how: by complaining on JD Power surveys that they couldn't figure out how to use it. But the rest of us oohed and aahed at the mere idea of a radar system that automatically speeds you up and slows you down. "Mercedes must be crazy!" we all thought. And then they came out with that weird C-Class hatchback and proved us right. Well, only a few short years later, Mazda is offering adaptive cruise control in its compact car. In other words: the technology isn't cool anymore. Now it's mainstream. Everyone has it. It's everywhere. It's common. Once you can get it in a normal car, luxury car buyers can never brag about it anymore. "Did you hear about my dual clutch transmission?" some Porsche owner will say, at a party of luxury car owners. "Oh," a BMW driver will reply. "That thing they use in the Ford Focus?" And then they'll all laugh and laugh at the Porsche owner, who will go home and hang himself with his red seat belts. So what does Mercedes-Benz do? The answer is: develop more cool stuff. The only problem is that it's getting seriously difficult to develop enough crap to stay ahead of everyone else. New Fords will read your text messages to you. The Honda Accord has a camera that shows you what's in your blind spot. The Dodge Dart can show you a photo of the interchange where you're turning — and highlight the lane you need to be in. The Mazda6 will automatically stop you before you crash. And the freaking Kia Forte has heated rear seats. So Mercedes-Benz is hard at work, over there in Germany, constantly developing new technology. Because if they ever lose their position as today's most high-tech automaker, they'll have to trade on their other reputation: beautiful, handsome, solid, high-performance cars that last as long as chewing gum. And everyone knows Audi already has that market cornered.